This dish would be called “aloo fry” in India. I know Atkins would be turning in his grave, but growing up, I loved to eat this alongside some white rice with ghee. Carbo overload? You betcha! These days, I like these potatoes as an accompaniment to roast beef, roast chicken, or sometimes just as a snack. These also work great alongside some scrambled eggs and a fruit salad for a hearty brunch. And every so often, for old times sake, I eat these with some hot basmati rice and ghee. Nirvana! As for the potatoes, any waxy kind will do, but I am very partial to the buttery, sweet taste of Yukon Golds. And if at all possible, organic please. Do you know that potatoes have some of the highest pesticide content amongst produce? Not to mention, the organic ones are so much sweeter. The red chilis do lend a fiery kick to the potatoes, so use sparingly if you want less heat. That said, you never quite know, as each batch and variety of red chilis comes with a surprise heat factor. You could also use red chili flakes if you prefer. Heat canola oil in a 12-inch, well-seasoned cast iron pan or a nonstick pan. Add cumin seeds, mustard seeds, and red chilis if using. When the seeds start to splutter, add garlic and potatoes. Sprinkle with salt. Cook over medium heat, stirring occasionally for 15 minutes. Do not over-stir. You want the potatoes to brown well. Stirring too much will cause them to mush up. Cover the pan and cook 5-10 minutes, until potatoes steam and cook through. 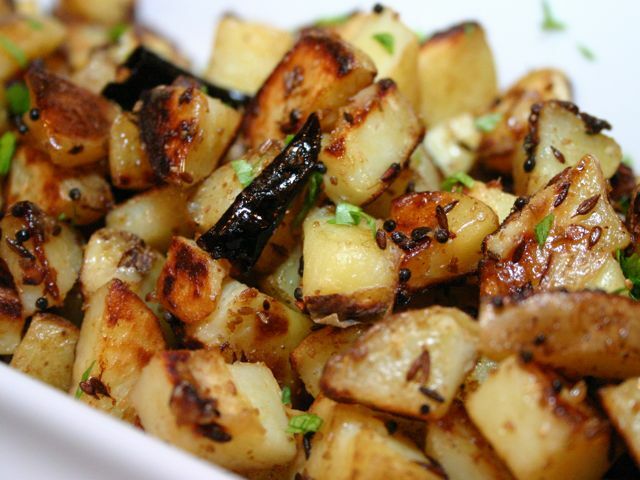 When the potatoes are tender, sprinkle with cumin powder. Continue to brown potatoes till they're crisp. Garnish with chopped cilantro and serve.